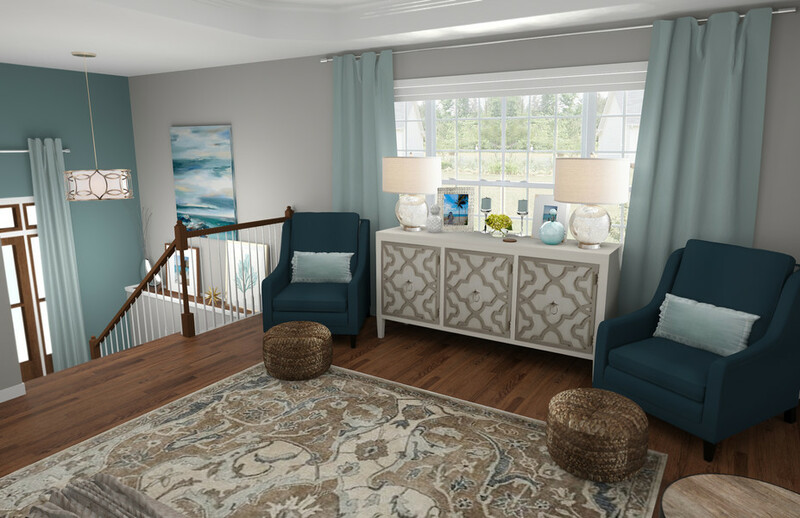 We'd like to continue working with Rachel to finish out the rest of our space including the living room, dining area and foyer. 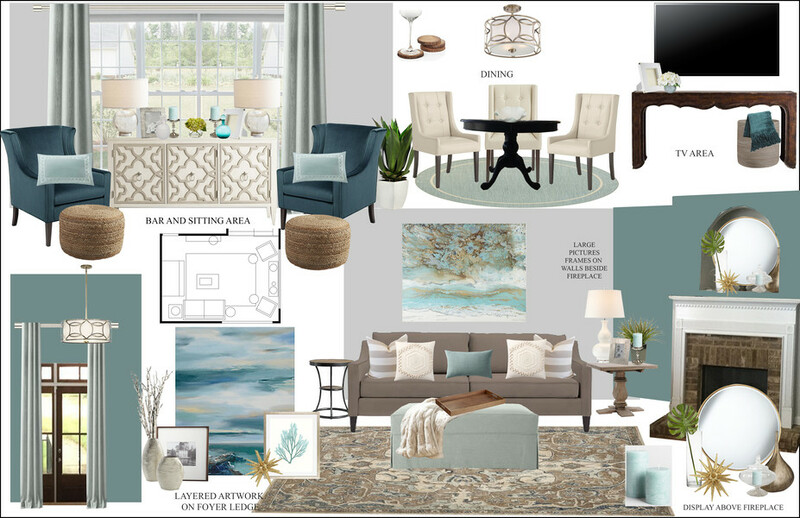 This is a private project for Rachel including renderings for the living room. For the dining area and entry we just need a concept board + shopping list. I want to update lighting in all rooms. I'd like to get suggestions for blinds to be used in all rooms, maybe honeycomb blinds that will insulate better. When guests come up the steps the furniture layout tends to funnel everyone to the dining area, even if no food is involved. 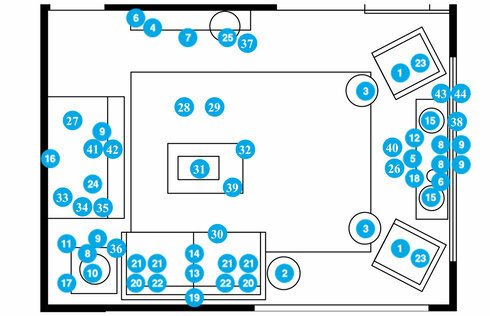 There just isn't a good flow to the rooms. I am looking for a warmer, more polished overall look. The other design challenge, is that it has to be dog dog friendly. Two of my dogs like nap on the couch and the other is always stretched out on the floor. Fabrics that can be cleaned or slip overs are a must. When all 3 play, it's like a herd of buffalo running through the room. A coffee table with sharp edges or that can be easily broken won't work. The front door, while pretty, lets everyone look straight through the house, hence the curtains. I should have gone floor to ceiling with them for a more dramatic look. We really need a better bar cabinet/area. Nearly everything we have is stashed in an empty guest room. I'm willing to replace anything. There are few pieces that I've taken a pic of that might be able to be used if they work with the new design. There are 3 of the hurricane candle holders. I'd like new window treatments + light fixtures. I'm open to replacing all of the furniture, but I want to keep the glass hurricane. Using lighter colors in your medium-sized room will make it feel more airy and bright. Teal accent with existing grey. For your main color, we chose to use blue because it is calming, relaxing, and serene. It ris reminiscent of blue skies and deep blue oceans. Quantity: 2 Teal Discount link available to project holder only 40" high, 31 1/2" wide, 34" deep. Quantity: 2 Discount link available to project holder only Height: 12.75" Diameter: 19"
Quantity: 2 Discount link available to project holder only Inner: 5" x 7"; Outer: 11" wide x 2" deep x 13" high. Quantity: 3 Discount link available to project holder only 6-1/2" dia. x 8"H.
Quantity: 4 Discount link available to project holder only 3"x4"
BELGIAN LINEN CROSS WEAVE KNIFE EDGE PILLOW COVER - LUMBAR (16150003 SPRU) Spruce Discount link available to project holder only 13" x 21"
PREMIUM DOWN PILLOW INSERT (16100007 NONE) Discount link available to project holder only 13" x 21"
Brown and Green Grass in Black base Square Ceramic Planter (EU1V927) Discount link available to project holder only 12-Inch deep. 15-Inch-H. 12-Inch-W.
Line Collection Champagne Medium 18 1/2-Inch-H Bottle Vase (EUX6571) Sale Ends Soon Discount link available to project holder only 18 1/2-inches high. 12 1/2-inches wide. 6 3/4-inches deep. Paidge Sofa Marled Microfiber, Mink Taper Chocolate Down Blend Filled Discount link available to project holder only 86.5"w x 40.5"d x 34.5"h (30.75"h without cushions). RUCHED FAUX FUR THROW - IVORY Ivory Discount link available to project holder only 60"x80"
Silver Cement Photo Frame - 4x6 (EU7D275) Discount link available to project holder only 8-inches high. 1-inches deep. 6-inches wide. Holds a 4x6 photo. Natural Beach Sand Vase Filler (432209) To use with sand for clients existing glass vase on the fireplace. Put sage candle inside. Discount link available to project holder only 24 oz. Oversized Adjustable Metal Rod - Polished Nickel Discount link available to project holder only 108"-144"
Quantity: 2 Spruce Discount link available to project holder only 96" x 50"